Our colleagues at SAMHSA have just released a new Treatment Improvement Protocol (TIP), Addressing Viral Hepatitis in People With Substance Use Disorders. This is an important and helpful step toward achieving the fifth goal of the Action Plan for the Prevention, Care & Treatment of Viral Hepatitis, which calls on us to ensure that persons who use drugs have access to viral hepatitis prevention, care, and treatment services. Chief among the ways we can advance this goal is by integrating viral hepatitis prevention and care services as standard components of all substance abuse treatment programs. Injection-drug use is a primary risk factor for exposure to bloodborne pathogens such as the hepatitis B virus (HBV) and hepatitis C virus (HCV) because of needle-sharing and other drug-related behaviors. Among new cases of hepatitis C reported to CDC, injection-drug use is the most common risk factor. Research shows that injection-drug users (IDUs) have high rates of viral hepatitis infection with an estimated 64% chronically infected with HCV and up to 11% chronically infected with HBV. IDUs are not only disproportionately affected by these viruses, but they are also more likely to have adverse hepatitis-related health outcomes compared to other infected populations—primarily because of related health conditions (known as "comorbidities") and inadequate access to and receipt of needed health services. Dr. H. Westley Clark, Director of the Center for Substance Abuse Treatment at the Substance Abuse and Mental Health Services Administration, reminds us that "Viral hepatitis is often a silent disease until severe liver damage has occurred. Substance abuse is a major risk factor associated with viral hepatitis and yet, behavioral health providers are often not well informed about this potentially lethal disease. TIP 53 was written to address this knowledge gap among our providers with the goal to improve care for clients with substance use disorders." Given the high prevalence of viral hepatitis among drug users, integrating viral hepatitis into evidence-based medical and behavioral drug-treatment services can prevent new viral hepatitis infections and improve the health outcomes of those found to be living with chronic HBV and HCV by connecting them with appropriate care and treatment. Raising awareness and educating drug treatment program administrators and staff through this new TIP is an important first step toward expanding integration of viral hepatitis services. 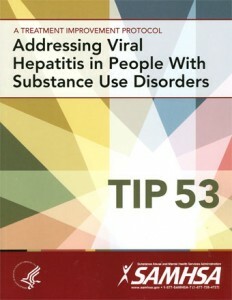 The new TIP assists behavioral health professionals who treat people with substance abuse problems to understand viral hepatitis prevention, care, and treatment and how these issues can be integrated into substance abuse treatment programs to better address the needs of their clients who are at risk for or infected with viral hepatitis. This document is written using everyday language and includes visual aids that help to explain many of the technical aspects of HBV and HCV disease progression, testing, and treatment. I encourage you to read this TIP and share it with any of your colleagues and co-workers who have an interest in viral hepatitis and improving the health of persons with substance use disorders. .
You can download or order a free copy of the new TIP here.